Thinking of joining a new yoga class? That’s awesome! To get the best results from your yoga lesson, you need a comfortable area to work out for every yoga move. Simple design, easy to carry, and extremely comfortable, yoga bed mattresses are your best shot really. They will provide you with a comfortable yoga workout area, where you’ll have the freedom to spin around, stretch, and move. More importantly, they can also double up if you need a comfy resting place for your favorite TV program, picnic, play, or meditation area. In this yoga bed mattress review, I took some time to look around and find the best quality yoga mattress that you could spend your money on. The designs that I got were pretty cool and you can buy them anytime for your next class. The expert reviews, customer feedback, features of the yoga bed, best brand types, pricing, and more importantly the overall design. Thanks to the help of a few yoga workout experts, we rounded the top five with the least challenges and managed to prepare this expert review and buying guide just for you. If you are just starting out on these types of mattresses, you came to the right place. Take a look at our ultimate buyer’s guide and well-researched yoga bed mattress reviews and get your very best mattress today! 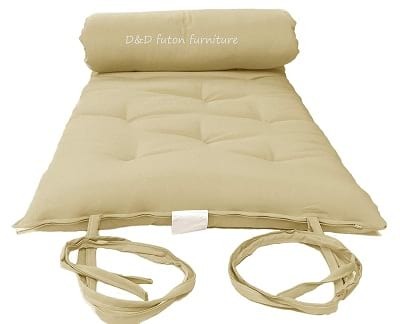 The D&D Futon Furniture Brand New Full Yoga Meditation Mattress is top of my list. Why? This is a full sized bed that’s basically 54″ Wide and 80″ Long. It is 3 inches thick and is made of cool cotton batting for added comfort and high style flexibility. Because of this, this mattress is super easy to roll up in a compact design when you want to store. It is also easy to roll out when you intend to make use of it for your visitors, picnics, or meditation. The cover material is also made of highly durable polyester. Polyester is easy to clean but different from cleaning air mattress and will have a longer lifespan. It is also waterproof and you can clean out sweat or spillage without worry of messing up your mattress. Because of its extra thickness, this best-rated futon mattress can also be used for sleep and simply taking a rest while catching your favorite TV program. However, you might find the mattress slightly shorter in overall width and length upon opening. But this shouldn’t worry you as it will stretch out and pull to its full length after some time. Wide enough – 3 inches thickness. 54″ Wide and 80″ Long. Super easy to roll up. Slightly shorter upon first use. There isn’t a major difference between the D&D Futon Furniture Twin Size Mattress for yoga and the previous design that we just saw. In fact, this is a rather lower version of what we saw. This best mattress for yoga is slightly smaller and comes at a size of 39″ Wide X 80″ Long. 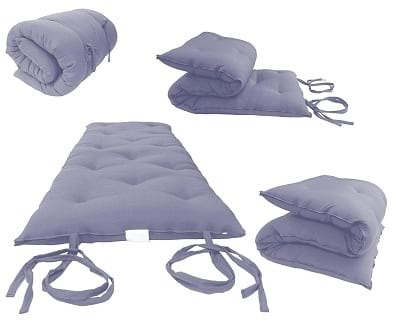 Nonetheless, it is also super ideal for picnics, sleep, rest, yoga, and as a massage mattress whenever you need it to. More importantly, the mattress is extremely comfortable and comes with two fiber layers, a foam layer, and white cotton battings in the inside. It has a cover made of 100% polyester that you can easily clean without worrying about inflicting any damage to the foam. You don’t have to worry about the storage though. The mattress rolls up easily and will fold up into the most compact size ever. Another top-rated Futon mattress for yoga is the D&D Futon Furniture 39″ wide x 80″ long Traditional Japanese Floor Futon Mattresses. Like its sisters, the mattress enjoys a thick sizing of about 3 inches. It is basically comfortable and will easily leave you with a worry-less sleep. The mattress comes in a unique stylish purple color that will basically allow you to enjoy a classic styling blend for your home if you get it. It is efficient for use in any living space and easy to store in a small but compact design. Thanks to its twin size compared to other designs that we have seen. Some of the best places where this mattress can be used include the patio, guest room, studio, and massage parlors. Nonetheless, the mattress small size doesn’t allow it to support so many people at the same time. But this is nothing to worry about really if you are buying it for personal use. For people who want a new mattress to use in their homes, Tan Traditional Japanese Floor Futon Mattress is what to look for. The mattress is extremely foldable and comes in a rather unique color. It is made of 100% polyester and offers one of the most durable designs. Even better, the mattress is spacious enough and comes in a solid size of about 30″ wide x 80″ long – which is a good way to compensate for its rather dull color. However, the 3-inch thickness provides you with an extremely comfortable mattress design specially for your personal use, resting, and kids playing time. Finally, the D&D Futon Furniture Brand New Queen Size Gray Mattress for yoga meditation wraps up our best yoga bed reviews. This stylish mattress not only comes with a great hue but is also big enough to accommodate two bodies at the same time. It is easy to fold in a small compact design and basically allows you to enjoy a great night sleep, fun-filled playing time with your kids, and a great body exercise platform for your personal uses. Like many other mattresses before it, it is easy to use, thick enough for a comfortable sleeping area, and more importantly, a polyester covered design. Using the mattress in your home is rather easy. However, compared to the previous designs, this one is rather pricey, larger, and slightly bulky – but what do you expect when you get a plus size with space for two? Now that you have seen the best quality yoga mattresses that we have laid out for you, it will be time to grab your next big design. If you want a mattress that can fit in your budget, here are a few things that you should keep in your mind. You can’t buy everything that we have laid out here – not when you are home alone! Because of this, it is very important that you only buy what you can afford. And the yoga-mattress that you can afford should have the right pricing for you. Determine how much money you want to use when buying your next big mattress and find a mattress that falls within this budget. You can never miss out on a great mattress if you are buying online. Thanks to the variety of choices here! The one thing that you should never ignore when buying a good mattress for yoga is portability. This is an extremely vital consideration. Any mattress that’s meant for yoga, picnic, or a comfortable setting all around the home should be easy to carry around. You should be able to tag it along for a picnic without a shudder and move around the rooms whenever you want your kids to play around. It is simple really, and the more portable the mattress is, the better it will be for your kids, loved ones, and also needs. Depending on the number of people that you want to lie out with, rest with, or have a picnic around, you should look for a yoga-bed that fits everybody in comfortably. Remember, every single loved one of your needs to feel the comfy touch. You can always get two or more of these mattresses. However, choose an ideal size for everyone would be the best remedy. You will get twin size bed and many more sizes to obviously go with too. For yoga, picnic, and personal enjoyment, a little color will go a long way. It plays a key role in developing a style of your own, giving the classic touch, and making sure that you enjoy some of the most befitting designs in your rooms too. There are a variety of colors to choose from for your personal enjoyment. You can always shop around the market to get what you really need. If your mattress must be portable, it has to be light in weight. An ultra-lightweight design is so ideal and will even boost your freedom of movement. You will be able to carry it around and don’t even notice that you added a few pounds around your backpack too. Durable material of build means a longer lifespan for your mattress. In fact, it would mean greater value for your money too. You need to choose cautiously so that you can get a long-lasting material for your mattress. Some of the best materials that have been used before to design such mattress include polyester. You can look for a few polyester designs that meet your needs and pick them out before you round the best features from them. The best thing about polyester is, it is waterproof and easy to clean. In addition to what we have seen, bulky mattresses will not be so great for yoga. You need a slim fit and possibly a yoga-mattress that’s extremely easy to fold up, store, and carry around as we mentioned. Such type of mattress must have a carry on storage bag that allows you to fit it in perfectly and still move around without a second guess of how you’d push the baby stroller around or carry the picnic box. Most manufacturers may not mention what their mattresses are made out of. However, if you buy online, you will have this advantage. You will not only get a review from them but you will also get a confirmation from the previous users. Some of the best mattresses for yoga will have comforting fiber, white cotton, or resilient foam. Some mattress companies are known to design the most stylish mattresses while others are known for durability, and such. You can always go with a brand that enjoys the best word around. For all mattresses around the block, looking for the right feedback is very important. A yoga bed mattress review such as any of these that we have highlighted around will help you a lot. This same applies to the feedback from previous users too. If you intend to have the very best mattresses for yoga, picnic or resting, make sure that you stick to the user reviews every single day. What Else Can I Use My YogaBed Mattress for? There are a number of things that you can use such a mattress for. They include sleeping, hosting visitors, laying a playing area for kids, picnics, massage, yoga classes, and personal exercise among many other things. Where Can I Use My Yoga-Mattress-Bed At? Yoga bed mattresses are virtually good for almost every area. Thanks to their extra easy ability to be moved around. Personally, I have used these beds in almost every room around my home. But I have seen people using them in patios, dormitories, massage studios, and mobile houses just to mention but a few. Where Can I Buy These Mattresses Easily? Online of course! When you buy online, you don’t have to move around the streets shopping, you won’t spend more than what you need to, and you get unlimited designs to choose from really. Online shopping also comes with good warranties, plus your package is delivered at your doorstep. How Regularly Can I Clean My Yoga Bed? That depends on how much you are using your bed. If you are frequently using your bed, you may have to clean it more. The environment will also determine how many times you do that. A dirty environment will mean constant cleaning. However, you don’t have to worry as a polyester material is easy to clean and extremely durable too. What Size of Room Can I Use the Bed? The good thing about these beds is that they come in a variety of sizes. What this means is, depending on the size of your room, you can always find the perfect fit mattress for your needs. Nonetheless, you can always go for a standard mattress in case you don’t have the freedom of space. Now you have it out there. The best yoga bed mattress reviews and also the simplest buying guide to work with. You should grab your best yoga bed right away. Buy online so you can save money, get the best deals. Remember you are new to these mattresses and the lesser you spend to get the best designs and features, the more ideal it will be for you. You can pick the one to start with from our top pick if you want to enjoy the best value for your money. These mattresses that we sampled are cool and super simple to work with. Many users even agree that they are some of the best deals they would go for if they were to make a new purchase. Good luck and let’s hope my review helped.